One of the most influential graduates of the Bauhaus in Weimar, Germany, Hungarian-born Marcel Breuer was a protégé of Bauhaus director, architect Walter Gropius. After graduating in 1924, Breuer was invited back to become master of the carpentry workshop at the new Bauhaus quarters in Dessau. 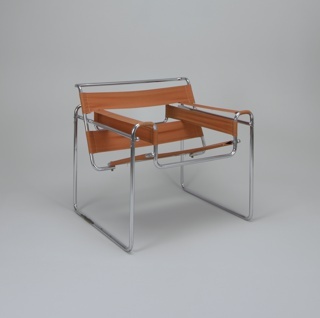 From 1925-28, aside from his teaching duties, he created a series of innovative modernist tubular steel furniture designs recognized for their light, sturdy and rational construction and manufacture. His later designs for aluminum furniture won first prize at the 1934 Paris international competition for the best aluminum chair. Uncertain of continuing work in Europe, Breuer moved to England in 1935 to form a... more. 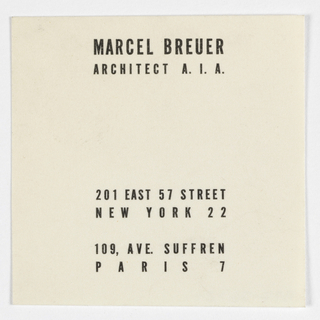 We have 6 objects that Marcel Breuer has been involved with.